Tennessee Williams, one of our greatest 20th century playwrights*, moved to New Orleans in 1939 and spent time there off and on for much of his life. The funky, colorful, bohemian spirit of NOLA suited Williams’ lifestyle, once he overcame the rigidity and religious upbringing of his family. 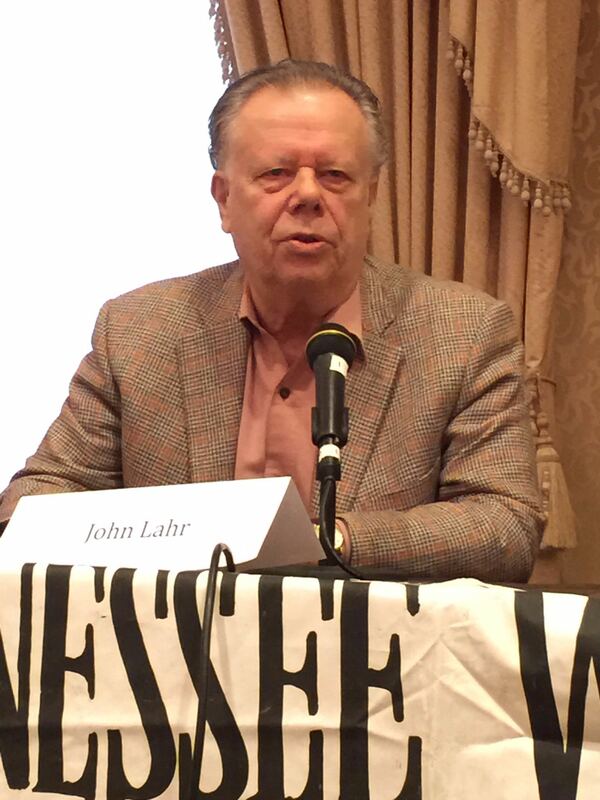 John Lahr details Williams’ life and work in his biography, Tennessee Williams: Mad Pilgrimage of the Flesh, which I wrote about last fall. *I would have said “the greatest,” but Eugene O’Neill and Arthur Miller also belong in the greatest category. Last week the American Theatre Critics Association met in New Orleans and our five-day agenda included many forays into the New Orleans that Williams loved. The 29th annual Tennessee Williams New Orleans Literary Festival was being held at the same time, so we participated in some of the many events. Our hotel was conveniently located at the edge of the French Quarter, so we walked to many venues. Williams, of course, in known for such iconic plays as The Glass Menagerie, A Streetcar Named Desire, Cat on a Hot Tin Roof, Sweet Bird of Youth, The Rose Tattoo, Night of the Iguana, Summer and Smoke, Camino Real, and Vieux Carré. But you may not know that he wrote dozens of other plays, both long and short, teleplays and screenplays, novels, poems, and letters. Hundreds of letters. Lahr says Williams was a compulsive writer. He stayed sane by writing. Lord Byron’s Love Letter, in which two midwestern tourists visit a spinster’s historic southern home. It seems she has inherited a love letter written by Lord Byron to her grandmother and she finally agrees to read it. Actor Christine McMurdo-Wallis handles this reading exquisitely (as she does several other roles during the festival). Lady of Larkspur Lotion and Mister Paradise, two short plays performed back to back in a larger room. The first play features Mrs. Wire, the boarding house landlady who appears later in Vieux Carré. Mister Paradise, a poet who appears in both plays, prefers to avoid the limelight despite the protestations of an admiring young woman. There were dramatic and musical intervals between the plays, as audience groups moved up and down stairs, from space to space. Clyde Shelby, a talented pianist, played for us in the first floor corridor and the Lagniappe Brass Band also performed. A Friday night treat was Blue Devils and Better Angels, Tennessee Williams Tribute Reading held in a tented space at the old Ursulines convent in the French Quarter. It was a perfect space for this series of readings from and about Williams by actors and writers including director John Waters, playwright John Patrick Shanley (who read from his upcoming play, Prodigal Son), British thriller writer Rebecca Chance, and “Ask Amy” columnist Amy Dickinson. Southern Rep Theatre, one of the few Equity companies in New Orleans, is staging Williams’ Suddenly Last Summer at the Ashé Powerhouse, a renovated venue in the old Jewish neighborhood. We saw the production Saturday afternoon. The performance was marred by poor sound quality (abetted by the constant hum of the AC system) but it was staged beautifully. The dramatic monologue by Catherine (played by Beth Bartley) about her cousin Sebastian’s shockingly bloody death was very well done. That evening, we walked over to the Monteleone Hotel, just around the corner from our hotel, to see a reading of I Never Get Dressed Till After Dark on Sundays, part of the TWNOLF schedule. This Williams one-act contains fragments that evolved into Vieux Carré, a 1973 play that Raven Theatre produced so memorably last year. This short play involves two ongoing arguments. Jane, a former Yankee society girl, and her boyfriend Tye, a stripjoint barker with an easy manner that attracts ladies, argue about their life together and apart. And the director, writer and stage manager bicker comically about the development of the script. The play is a bit disjointed but it helped to have seen Vieux Carré. You can appreciate how the relationship between Jane and Tye evolves. Vieux Carré, by the way, is set in the house at 722 Toulouse Street, between Royal and Bourbon streets, where Williams lived. An historic plaque now commemorates that. Williams also famously spent time in Key West, which I wrote about in 2013. The ATCA conference closed with two excellent discussions on our final morning, also part of the literary festival. The plays were “the interior landscape of my soul,” Williams said. His plays are all ghost stories: spectral and haunted. In his final play, A House Not Meant to Stand, Williams says goodbye to his “repertory company,” made up of his family, his friends and lovers, and himself. The play was produced in 1981-82 at the Goodman Theatre, directed by Gregory Mosher, who tried unsuccessfully to move it to Lincoln Center. The second Sunday morning discussion was Playwrights from Page to Stage featuring New Orleans native John Biguenet; Dr. Femi Euba, a native of Nigeria whose recent plays have addressed issues related to Hurricane Katrina; and playwright John Patrick Shanley. Moderator Thomas Keith asked each playwright to talk about how his works took shape on paper and then were transformed to the stage. The comments were wide-ranging, humorous and fascinating. 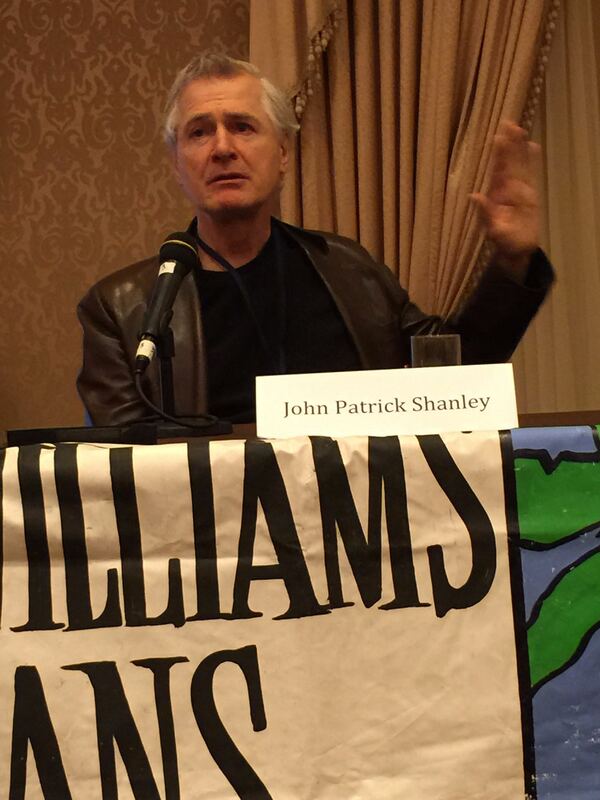 Shanley, in particular, is an articulate and charming commentator on his own work and the act and art of writing. And there was outstanding music, food (including that NOLA special, cold-brewed iced coffee), scenery and people-watching. New Orleans is an amazing city. I’ve been there half a dozen times over the last 25 years for business, vacation and the Jazz and Heritage Festival. I always fall in love with its color and charm all over again. Photos by Nancy Bishop except where noted.